Neil Young joined the Red Hot Chili Peppers to benefit Silverlake Conservatory of Music on Wednesday. Silverlake Conservatory of Music is a non-profit organization founded by Flea. The school is presently in its 13th year and offers private music lessons at a reasonable cost and grants scholarships to children in need, providing free lessons and instruments, serving over 700 students. "Neil is the kind of guy that's just always shown up for everybody and for himself," Flea told Rolling Stone before the show. "He's always been willing to take risks and to be willing even to fail. From the rock musicians from the Sixties, he's kind of the only one that's still relevant to kids.He was open to punk rock when it happened, he was open to electronic music when it happened. Needless to say, I'm a huge fan." At one point, as Young tuned his guitar he joked, "If I have to tune myself, we're all in trouble." But there was nothing but beauty, including a Phil Ochs cover, after which he said, "There were a lot of great songwriters back then. People liked to listen to words." Among his own songs, using only piano, guitar and harmonica at various points, the highlights included "Comes a Time," a sweet rendition of "Harvest Moon" and the closing "Heart of Gold." With the show coming just three days after Young's annual Bridge School benefit in Mountain View, California, Flea talked about their shared passion for education. "The Bridge School obviously is an incredibly beautiful thing," he said. "People get challenges in life. Neil had a kid with cerebral palsy, and instead of thinking, ‘Oh, how am I gonna deal with this?' he's like, 'OK, this is a great opportunity to learn about something and do everything I can to help . . . ' I'll play the Bridge School benefit anytime." 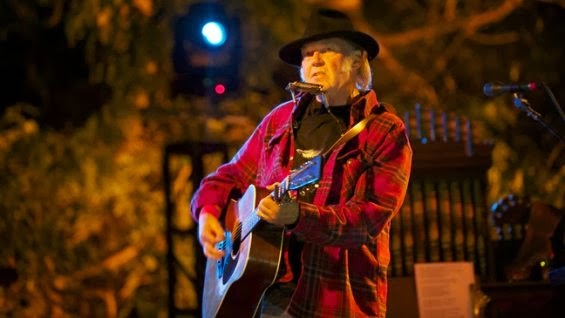 Young, 67, served up a half-hour-plus solo acoustic set Wednesday that included several of his own cornerstone numbers as well as versions of songs by fellow folk-rockers Bob Dylan, Gordon Lightfoot and Phil Ochs. The presence of one of rock's most respected veterans at the benefit, which started in 2003 at the tiny Edendale Grill with a small-scale performance by Tracy Chapman, signaled its growth from a grass-roots affair among the L.A. alt-rock community into a widely supported event. Young, dressed in a dark fedora and motorcycle boots, stomped and prowled the stage with his guitar and harmonica for most of his set. He also hunched over a battered upright piano for a couple of numbers on the temporary stage, which was erected on the grounds of the hilltop estate owned since 1998 by philanthropist Dana Hollister. Also, see more on the relationship of Red Hot Chili Peppers and Neil Young.